Exclusive Hobbit update: Casting, monsters, costumes! What exactly is going on with the two-part adaptation of The Hobbit? The world seems to be holding its breath in anticipation, including us, but as the calendar turned to November, we turned to a trusted rock-solid inside source and found a dragon’s treasure of updates. Even the most dedicated fans, those tracking the details and trying to fit together the jigsaw puzzle don’t have a complete picture. What happened to the scripts Peter Jackson promised were almost finished? How does Ian McKellen have scripts and know about Bilbo’s casting if the studio hasn’t officially even approved the budget for the film? Is everybody just sitting around counting the days? Where are the official announcements? What does the relative silence mean? Is everything still on schedule? What does the studio think? How the can filming begin in the spring if all this other stuff doesn’t get done? Our source deep inside the production has spilled the beans, or at least tossed out a few choice beans that with a little sunshine gathered from around the internet and with the waters of intuition and knowledge of other blockbuster productions, lets fans get a glimpse inside the garden walls of director Guillermo del Toro’s adaptation of J.R.R. Tolkien’s children’s classic. This has been much written about, to the point of being painfully repetitive as each new media outlet asks del Toro about the adaptation and process of bringing The Hobbit to a script stage. TORn reported details from producer Jackson’s geek court but by way of review, in case you missed it, the writing team of Jackson, del Toro and long-time Jackson collaborators Phillipa Boyens and Fran Walsh all worked on a script for the better part of a year and split The Hobbit into two films with information about Gandalf’s “off stage” efforts and the greater concerns of Middle-earth peppered through the narrative. Jackson presented a Comic-Con time table that suggested the script would be delivered to the studio by early September and now in November we haven’t heard of a script or budget being approved by the studios. There have been several public comments by the man everybody knows will play Gandalf (McKellen) who has also not officially been signed. He has stated that he has seen the script and knows a little bit about who might play Bilbo but Jackson was adamant that casting would happen after budget approval from the studio. 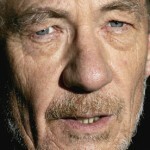 Our source reveals that the script is in more hands than just McKellen’s. With the many months of work put in, those will be finely polished scripts indeed and if del Toro follows the same methods used on LOTR, details and dialog may get changed until the moment cameras roll each day. But aparently “scripts” are finished to a point that “key people” can read them and know, at least in broad terms, what The Hobbit movie is going to be like. Oh to be deemed a “key person”! Keep reading for more evidence on just how polished those scripts are at this point. As the early months of 2010 approach (when filming is planned to begin) it gets increasingly difficult to believe that the actor playing Bilbo Baggins isn’t locked in for the films. The studios aren’t going to be taking a gamble on the titular character in two potentially billion-dollar grossing films by waiting until the last minute to secure somebody. Still, Jackson was crystal clear at Comic-Con that only the studio financing the film can hire actors and offer them money and negotiate schedules. So what gives? If it wasn’t clear from McKellen’s hints that he knows who Bilbo is likely to be, the “key people” phrase from our source all but confirms that somebody is Bilbo. Clearing 2010, for example, isn’t going to happen for actors or agents on a few weeks notice and has likely already happened. 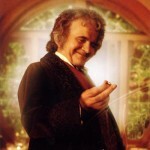 Mr. Baggins knows who he is and probably has some very high level assurances (del Toro, team Jackson, studio executives) the he is wanted and will be signed. It isn’t official, but it seems a certainty at this point that it has been agreed upon by all sides. In addition to Bilbo and Gandalf, it seems likely that Thorin Oakenshield has also been cast in every real way except officially. TORn or Variety can’t be handed a name but somebody is Thorin and they have probably been texting with del Toro and McKellen. Those three roles are the ones that demand the most screen time and while the rest of the Dwarves will have a lot of time demands, they will not have the same need to be well known actors and casting calls may yet go out for more supporting roles. Frequent visitors to TORn will recall that we reported with exclusive photos that the replanting of the Hobbiton set had begun in New Zealand. Greens take time to grow so they look mature on film and so despite no budget, it was known beyond doubt that practical locations were being thought about at the very least. 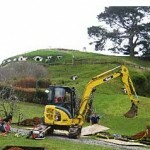 Our source revealed that Hobbiton is simply a part of a bigger work already being performed. Work is “50% complete on set (and) wardrobe design.” To be clear, let us pay careful attention to the word “design” and not jump to the conclusion that full sets are being built yet, although that seems possible or close. And it isn’t completely clear if costume design means planning of costumes or actual construction of costumes but without concrete, hired actors it seems fittings and such could not happen yet. It seems more likely that fabrics and color palettes and concepts are well underway with the conceptual art being translated to practical applications. Ngila Dickson, where are you? Of note, much of this work would often be deemed part of “pre-production” which would often happen after a film is approved and budgeted but either this is included in the development budget or a bill will be presented to the studio later. The point is, creative people are hard at work creating visuals for the two movies. Our friend who writes The Noldor Blog had an interesting post in early October that a new stage was being constructed at Jackson’s Stone Street Studios, that thanks to our source, his information suddenly seems so clear in the context of this new tidbit. Want a tour of the South Island? Middle-earth will still look like it did in Jackson’s films, thanks in part to New Zealand and while Hobbiton is easy, the rest of book requires unique visuals. Don’t worry, the team is already on it. Our source told us, “Location scouting in the South Island has started. We have identified several locations as possibilities to shoot.” If anybody sees teams of people pointing film cameras around the South Island while pointing and discussing and framing backdrops with their thumbs and index fingers in L shapes, drop us a line! Just how polished is that script? While the script polishing continues, it is seemingly solid enough that according to our rock-solid source, some remarkable preliminary stages of planning are well under way. Fangirls, start your squee engines. Reportedly, the production, “(is) actively story-boarding.” For those unaware, that means the team is creating a sort of rough sequence of images, something like a comic book, to help the team visualize the movie before cameras roll. This often involves the director and cinematographer choosing angles or organizing visuals that help avoid problems later when cast and crew are on hand and the process unifies the vision of the film. This is part of the process called pre-visualizing or “previs” as our source called it. “Previs is well underway,” we were told. Nobody can doubt the love that del Toro and Jackson have for beasties, to the point that they are almost like Harry Potter’s Hagrid character, putting (with Weta’s help) the nasties on screen with great adoration. The team is, “Already testing the animated models of several creatures and doing puppetry tests for others.” Some practical creatures were always part of del Toro’s plan and Jackson and Weta innovated digital monsters such as the FOTR’s cave troll a decade ago, allowing the director to enter a virtual reality were the creature is visual realized. How can all these things be happening? “Design work is almost 100% complete at Weta.” All that while we wait for their visuals in Avatar to land on us in December. Our conclusion is that plans for The Hobbit movies are moving forward under full sail and despite relative silence on the “official announcement” front, the much proclaimed March or April start date is right on track. Watch TheOneRing.net for more details as they become available and spies around the world send your information to Spymaster@TheOneRing.net.